John Kerry and Li Keqiang’s overlapping tours in Africa highlight their different approaches to the continent. In a perhaps not entirely coincidental turn of events, U.S. Secretary of State John Kerry and Chinese Premier Li Keqiang found themselves in Africa near the same times this past week. While Japanese Foreign Minister Fumio Kishida is also making the rounds, much attention is being paid to the waning influence of the U.S. and the rise of China’s industrial might in Africa, and what this means for the world economy and the politics in the region. China has had a few troubles with its African investments, from protests by Kenyan traders to the murder of illegal Chinese miners — largely due to accusations that China is only interested in resources rather than infrastructure and investment. Indeed, Li Keqiang tried to dispel notions of colonialism as “growing pains” at a speech earlier this week. “I wish to assure our African friends in all seriousness that China will never pursue a colonialist path like some countries did, or allow colonialism, which belongs to the past, to reappear in Africa,” Li said on Sunday. Kerry is facing his own set of problems. While China is the rising power with only a few controversies under its belt, the U.S. has to compete politically with history, human rights, and a free international press. Human rights organizations like Freedom House have already criticized Kerry for his visits to Angola, the DRC, and Ethiopia — which, the day before Kerry’s arrival, arrested six bloggers and three journalists. While Kerry and the U.S. would be mad to ignore such a strategic economic and security partner in the region for this reason, it highlights a problem that China won’t face. Domestic scrutiny over a partner’s human rights record is simply something China doesn’t have to deal with. 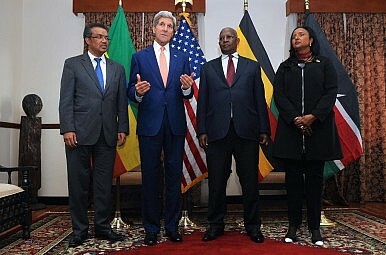 Kerry has already met with failure in South Sudan, where he said an agreement had been reached to restart peace talks. Before Kerry even ended his Africa trip, “Vice President-turned-rebel leader” Riek Machar disparaged these hopes. Kerry also made a mess of things in the Democratic Republic of Congo, where he promised $30 million in election assistance for the upcoming 2016 presidential vote. However, Kerry urged President Joseph Kabila to step down at the end of his current term in accordance with the DRC’s constitution. Disregarding the fact that the U.S. has supported and installed its fair share of dictatorships in the region, U.S. political goals are likely to fall as hollow as any hopes of overtaking China as Africa’s number one trade partner. While Kerry ran from country to country to preach democracy and stability, China has no such qualms or goals. Li, whose visit is slated to end this Sunday, stated on his visit to Ethiopia that trading with China comes with no strings. With over 2,500 Chinese firms and $210 billion in trade between China and Africa, combined with the fact that Chinese investment left U.S. investment in the dust way back in 2009, China certainly has the upper hand in the future of Africa investment. Despite China’s wish to paint itself as a developer rather than a colonizer, concerns have been raised over China’s policies in raw materials, as the great Middle Kingdom simply takes natural resources from places like Angola — one of China’s largest oil suppliers — but tends to import Chinese workers rather than creating jobs for locals. In other countries, China’s labor policies have led to strikes, like those that happened in Chad and Niger. While China’s development-at-all-costs hymn is not a very pleasant one, it’s a song Li is singing to success all across the continent. It’s a tune many investment-starved nations in Africa are happy to dance to, at least for now. The first China-Africa summit since 2006 provides clues about the future of China's role on the continent. China's President Xi Visits 'All-Weather Friend' ZimbabweChina, the US, and Africa: Competition or Cooperation?At Two Sessions, China Seeks to Bolster Cooling EconomyAre Chinese Loans To Africa Good or Bad? That’s The Wrong Question.Is eSwatini on the Brink of Cutting Ties With Taiwan?